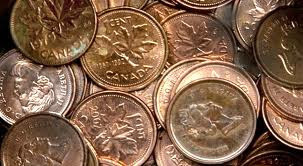 "That's worth a pretty penny"
Those are just a few of the phrases that will soon be obsolete to Canadians because as of today, the penny is no more. After 137 years, the penny is being phased out. In fact, the last penny actually struck on May 4, 2012. The penny was a nuisance. I either had none in my wallet or I had 18 if them and like everyone else, would dump them in a bowl. With electronic debit now, that's not as much as a problem anymore but it was a problem for the government as each penny cost 1.6 cents to make. Talk about a money loser! According to the National Post, there apparently there are 35 billion, that's right billion, are still in circulation or 82 million tons waiting to be melted down. Today the new rules for cash payments are that stores are to round up or round down to the nearest nickle. Some stores are advertising that all transactions will be rounded down. Electronic payments are not involved, only those concerning cash. Today I encountered my first non-penny transaction at the food court. My bill came to $8.42, which now would be rounded down to the nearest nickle or $8.40 and I gave her a $10 bill. I found it funny that the woman had to pull out a calculator to figure out my change explaining her terminal is not set up yet for the rounding. It's $1.60! It's not hard. I was there before the lunch rush so that woman may have a very long day or likely will catch on pretty quick. There is talk the nickle is going next. I don't like that idea. Seems like the Canadian penny is not "worth every penny" any more!